The Geissele SSA trigger is a semi-automatic only version of Geissele Automatics’s Super Select-Fire trigger. The Geissele SSA is a 4.5lb. non-adjustable combat trigger that is a precision two-stage trigger and allows precise and accurate trigger control. The SSA’s two-stage design allows the trigger to be light enough for accurate and precise shots, but forgiving enough for CQB. The SSA is safety certified by Crane Naval Surface Warfare Center. It is recommended for demanding applications such as Law Enforcement use, Close Quarters Battle (CQB) and mid-range carbine work. Geissele SSA 2-stage combat trigger has a fixed 4½ lb. total pull weight, non-adjustable sear engagement, and additional safety features ideal for CQB and mid-range carbine work. A secondary “safety sear” captures the hammer if the primary sear accidentally releases due to hard impact, ensuring the rifle can fire only when the shooter actually pulls the trigger. Trigger pull is optimized for both deliberate, aimed fire and quick, “snap shooting.” The first stage builds gradually to 2½ lbs., with a 2 lb. second stage that breaks clean, so the shooter can stay on target throughout the pull. A lightweight hammer driven by a full-power hammer spring speeds lock time and delivers positive ignition of all ammo types. All contact surfaces are wire EDM cut to exact dimensions for precise engagement free of play. Direct replacement for factory trigger; may be installed without removing the safety. Operation and parts layout is similar to the USGI M16 trigger for easy maintenance. All springs are captive to simplify field disassembly for cleaning. Hammer and trigger pins are a close slip-fit in nominal .154″ (small pin) mil-spec receiver holes to enable installation with basic tools. 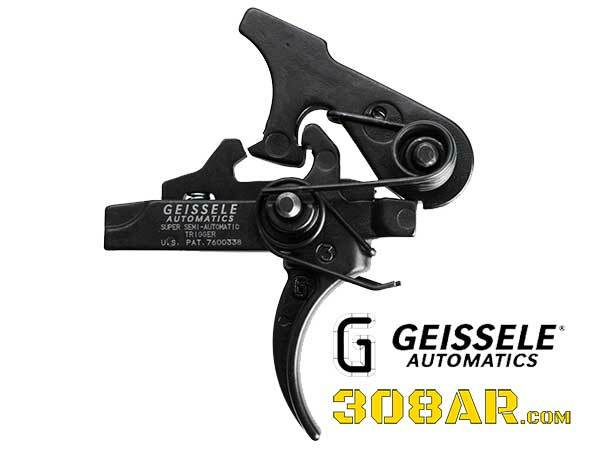 Geissele SSA-E Trigger offers an even lighter, 3½ lb. total pull weight, making it an excellent choice for precision Squad Designated Marksman type rifles where both accuracy and reliability are critical. First stage builds gradually to 2.3 lbs., followed by a 1.2 lb. second stage with a crisp, “candy cane-like” break. A semi-auto-only version of the Geissele full-auto combat trigger presently used in the U.S. Special Operations community. SPECS: Steel, black finish. Fits semi-automatic AR-15/M16 receivers with .154″ diameter hammer and trigger pin holes. May be installed in AR-style .308 rifles that accept AR-15 triggers. Kit includes trigger and hammer assemblies, springs, hammer pin, tube of grease, and illustrated instructions. The Geissele SSA Trigger has a pull weight of about 4.5lb. 2.5 lbs on the first stage and 2lb on the second stage. The pull weights and sear engagement are non adjustable by the shooter. The Geissele SSA trigger allows the shooter to slap through the trigger pull on close in shots but also set up a long range shot with a crisp trigger break. A full force hammer spring is used for quick lock time and positive ignition of all types of ammo. There is no lightened hammer spring used. The hammer is lighter than a standard AR15 hammer. The lightened hammer favorably decreases lock time and increases accuracy of the weapon, especially for snap shots. The Geissele SSA is a simple design that is very similar to the original M16 trigger. The number of parts is identical. The Geissele SSA is a 2 stage trigger where there is generous overlap of the sear surfaces which contributes to safety and a low tendency of any inadvertent movement of the trigger to discharge the weapon. The Geissele SSA has a patented pseudo sear that is almost identical to the standard AR15 single stage sear. However, this secondary sear has surfaces that never touch during normal operation. This sear prevents the hammer from falling unless the trigger is pulled. ASSUME EVERY WEAPON IS LOADED. DO NOT LET THE MUZZLE POINT AT ANYTHING YOU ARE NOT WILLING TO DESTROY. Unload rifle and make safe. Remove existing trigger and clean receiver. It is not necessary to remove the safety. Remove the trigger pin from the trigger and replace with the slave pin to hold the disconnector in place. Install trigger and slave pin into rifle. Align slave pin with receiver pin holes. Insert trigger pin into receiver, through trigger/disconnector, and into receiver on opposite side. Remove hammer pin from hammer. Place a drop of lubricant in the bore of the hammer pivot. Install hammer into receiver with hammer spring legs on top of the trigger pin. Insert hammer pin into receiver, through hammer, and into receiver on opposite side. Apply a small amount of lubricant in the following locations: a. Each side of the disconnector above the trigger pin b. Hammer and trigger sears c. Face of the disconnector d. Hammer tail where it contacts the disconnector; e. Top of each side of the hammer spring where the spring contacts the receiver wall. Check safety operation: With the hammer cocked and the safety selector set to the SAFE position, pull the trigger hard. The hammer should not fall. Check trigger reset: Set safety selector to FIRE. Dry fire weapon and keep trigger held back. Pull charging handle all the way back and release, letting the bolt carrier snap forward. The hammer should not fall. Release trigger. Hammer should be caught by the trigger. Check for the presence of a second stage: Set the safety selector to FIRE. Pull the trigger through the first stage until it comes to a distinct stop—this is the second stage. Applying additional pressure to the trigger will allow the weapon to discharge. Maintenance of the SSA trigger consists of occasionally placing a drop of lubricant on the locations shown in #7 above. Recommended lubrcant is CLP or equivalent; alternatively a high quality grease may be used on the trigger/hammer sears and disconnector contact surfaces. When the trigger and lower receiver well become very dirty (such as when firing with a suppressor), it is not always necessary to remove the trigger group for cleaning. Spray down the trigger group with electrical contact cleaner to remove residual oil and dirt. Next, use compressed air to blow off the trigger group and then flush liberally with a light lubricant as CLP or equivalent. Blow off excess lubricant with compressed air and lubricate as noted above. The Geissele Super Semi-Automatic trigger is a 4.5 lb. non-adjustable precision combat trigger and allows precise and accurate trigger control. The SSA’s two-staged design allows the trigger to be light enough for accurate and precise shots, but heavy and forgiving enough to be safe. The SSA is safety certified by Crane Naval Surface Warfare Center. It is recommended for demanding applications such as Law Enforcement use, Close Quarters Battle (CQB) and mid-range carbine work. The SSA Trigger will lighten the trigger pull relative to a standard trigger. This lightened trigger pull will make the firearm easier to discharge. You must recognize and accept this fact before installing this trigger. If you do not want a lighter than standard trigger pull or are not willing to accept responsibility for the safety of your firearm, yourself, and those around you, do not install this trigger. Geissele Automatics recommends installation by a certified gunsmith only.